1. Revenues: These are inflows received or due for goods sold, services rendered or other activities of the firm. 2. Expenses: These are outflows relating to goods sold, services rendered and so on. 3. Other Income and Expenses such as finance costs and finance income received. The Income statement can be presented using a single-step or multi-step format. In a single-step statement, all revenues are grouped together and all expenses are grouped together. A multi-step format includes Gross Profit, Revenues less Cost of Goods Sold. The above Income Statement is an example of the multi step format. No firm can survive for long without Revenues (sales), as these are the main source of cash inflow into the business. Revenues are the first line item in the Income Statement from which out flows of cash are generally settled. These are outflows relating to costs incurred to generate Revenues and include Cost of Goods Sold, Operating Expenses, finance costs and Taxes. Expenses are grouped according to their function or nature. Presenting all costs associated with manufacturing as Cost of Goods Sold (labour, raw materials etc.) is an example of grouping by function. Grouping all depreciation expenses (e.g. motor vehicles, manufacturing plant) in one line is an example of grouping by nature of the expense. This is the amount left after the direct costs of producing a product or service (Cost of Goods Sold) are subtracted from the Revenues. No firm can survive for long with a Gross Loss that is Cost of Goods Sold higher than Revenues. 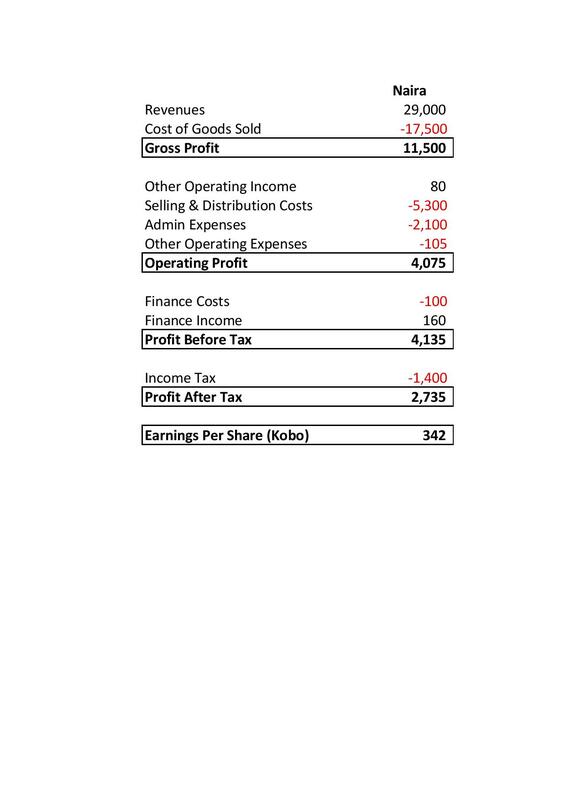 The Operating Profit or Loss is arrived at after subtracting Selling and Distribution expenses, Admin expenses and Other Operating expenses from the Gross Profit. For nonfinancial firms, Operating Profit is profit before financing costs/income, Taxes, and non-operating items are considered. This is the Operating Profit less finance costs, less Other non Operating costs plus finance income. This is the Profit before Tax less Taxes. This is the bottom line and it increases the owner’s equity (claim) in the business. While a firm can survive without making a Profit after Tax, most investors will prefer a firm that makes a profit because that is what matters at the end of the day for a company with a profit motive. This is Profit after Tax divided by the number of shares outstanding. In the next part, we will examine the Cash flow Statement of a manufacturing company.